It has been a very hectic few days around here! Christmas Eve and Christmas morning bliss, followed by family dinners and some post-Christmas Day shopping. I’m completely exhausted and looking forward to laying low for a few days. But first! I did want to share some of the yummy things that have made their way out of the SweetRevelations kitchen in the past few days! This past Friday was the last day of school for my children before Christmas break. This was the first year that I sent a box of baked goods for their teachers. I know, big surprise, it was cupcakes. But, in my defense, baking is a way for me to express to others that I care about them, that I’m thankful for the things that they do, that I appreciate all of the “extra’s” that the teaching staff. Well, and doesn’t a gourmet cupcake say all of those things? 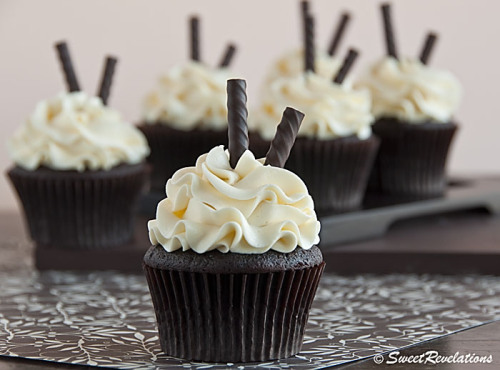 Something rich and decadent with a minty frosting? Ok, maybe not, but a few minutes with a yummy moist piece of cake and some peace and quiet sure doesn’t hurt on the last day before Christmas break. I love the contrast of these cupcakes. Dark Chocolate cake (gosh I’m so predictable) and creamy Peppermint Swiss Meringue Buttercream. Just a hint of peppermint. And I thought, to keep these somewhat elegant and classy looking (ahem..like the teachers at our school…), I would use some chocolate coated peppermint sticks as a garnish. These smelled so wonderful and tasted like a classic winter mint chocolate. 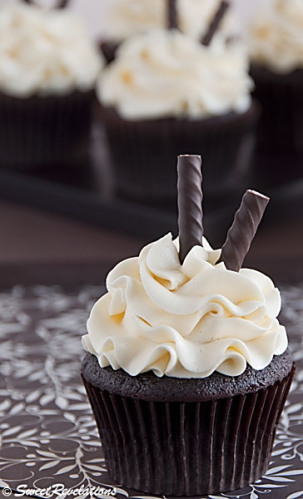 First, make some of these Dark Chocolate Cupcakes, without the added espresso powder. Then, top with some Peppermint Swiss Meringue Buttercream (below). 1. Fill a saucepan (large enough to fit your mixing bowl just a few inches) with two inches of water. Bring the water to a boil, then reduce heat to med-low so water continues to simmer. 2. In your stand mixer bowl, hand whisk the egg whites and the sugar just until combined. Place over simmering pot and whisk for approx 4 mins until the egg whites are hot (about 150 degrees). The sugar should be dissolved by this time as well. Place bowl on stand mixer and attach the whisk attachment. Whisk on medium speed until whites have increased in volume, are thick and glossy and the outside of the bowl is just slightly warm to the touch (this can take up to 10 minutes!). 3. Remove whisk attachment and replace with paddle attachment. Beat on low-speed until mixture is completely cooled. Increase speed to medium and add butter pieces one at a time. Scrape the bowl and continue to beat until buttercream is glossy, smooth and thick. It may separate at first, but continue beating and it will emulsify. Add vanilla flavouring, a pinch of salt and peppermint and beat until combined. Add food colouring if desired. Use immediately.